The Concordia Center for Public Policy hosted a summit of mayors from Orange County cities to discuss the issues and challenges facing mayors in today’s economic climate. 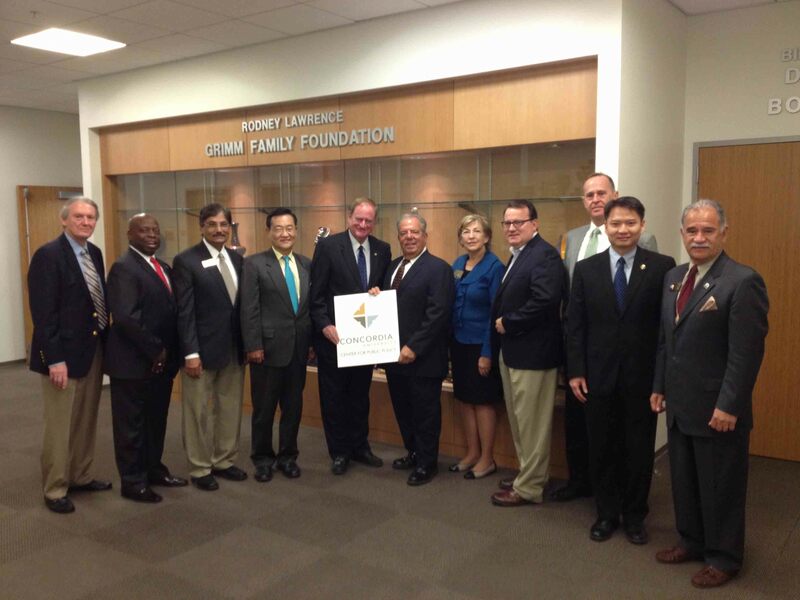 L-R Orange County Mayors meet at Concordia: Gary Miller, Seal Beach, Al Murray, Tustin, Prakash Narain, Cypress, Steven Choi, Irvine, Keith Curry, Director of the Center for Public Policy and Newport Beach, Bob Foster, featured speaker and Mayor of Long Beach, Beth Swift, Buena Park, Jim Righeimer, Costa Mesa, Tom Tait, Anaheim, Tri Ta, Westminster, Ron Garcia, Brea. A member of the Concordia University system of The Lutheran Church – Missouri Synod and guided by the Great Commission of Christ Jesus and the Lutheran Confessions, Concordia University Irvineempowers students through the liberal arts and professional studies for lives of learning, service and leadership. Connect with CUI through its numerous social media channels.